Frustrated head coach Ian Hassall has backed his ailing Ripon side to turn the tide and stave off relegation from Yorkshire Two this season. Ripon succumbed to a ninth defeat on the trot against fifth-placed Old Rishworthians when they had two players sent off and lost 31-7 at Mallorie Park. The defeat plunged Ripon into further trouble but they remain third bottom after student outfits Leeds Medics and Dentists and Sheffield Medicals both lost. The gap, however, to the rest of the table was stretched to eight points following Moortown’s victory over Roundhegians. “We need to keep working hard, which they are doing,” Hassall said. “I hope the results will turn for us because the players are showing signs of it. “You look for positive reactions from players and we have had that. We are starting to get a bit more strength in depth in positions that we need. This Saturday, Ripon travel east to Goole, a side that were promoted from Yorkshire Three last season and have won exactly half of their league matches this season. 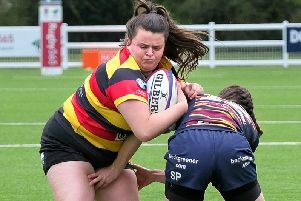 However, their form has slipped of late and they have only picked up one win in their last five - a 17-16 win over Old Rishworthians last month. Hassall added: “Goole have done what should have probably happened to us this year by building a winning team coming up. They are a young side that have been coached well. “We have to start going to games and consistently asking questions. If we can consistently perform throughout a game we will get some results. The one high spot of Ripon’s game against Rishworthians was a seven phase retention spree, which led to Ben Buckley scoring their only try. Bob Whitaker started the move to put Newby into space and hot on his heels was Buckley to receive a perfectly timed pass and outpace the defence. Whitaker finished what he started, with a precise conversion. However, the Blues were unable to breach the visitors’ defence again and Rishworthians imposed themselves. It turned ugly for Ripon in the second half when Dud Stead was sin-binned for repeated offences before veteran centre Mark Spilman was red-carded for a late high tackle and Iain Barker was also sent for an early bath for fighting.